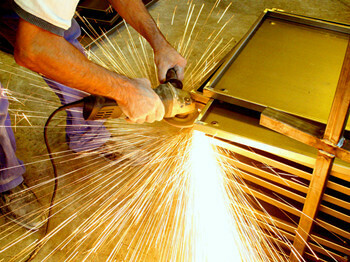 Metal fabricationi s the building of metal structures by cutting, bending, and assembling processes. It is a value added process that involves the creation of machines, parts, and structures from various raw materials. Metal fabrication jobs usually start with shop drawings including precise measurements, then move to the fabrication stage and finally to the installation of the final project. Fabrication shops are employed by contractors, OEMs and VARs. Typical projects include loose parts, structural frames for buildings and heavy equipment, and stairs and hand railings for buildings. We offer many metal materials that are suitable for various part applications and industries. Materials range from aluminum, stainless steel, titanium to brass, copper and others. In-house Additional Services We have CNC machining capabilities to handle all secondary drilling, countersinking, counter boring, reaming, and detailed machining. We also do stamping, tapping, deburring and assembling. Contact us to see how we can provide overall value to your metal fabrication needs.